This wildlife photograph is of a male Painted Bunting captured at a bird feeder on my front porch. 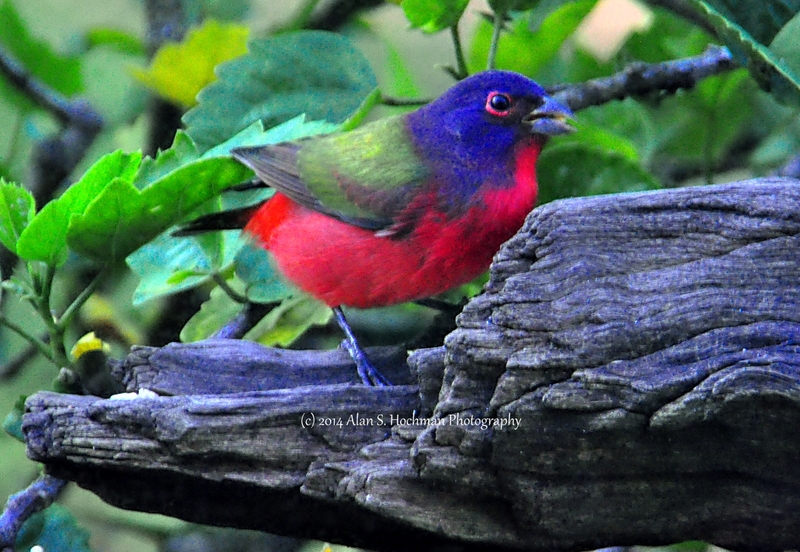 This male Painted Bunting was shot using a Nikon D90 camera body attached to a Tamron 28-300mm lens. Painted Buntings eat seeds for most of the year, switching to mostly insects in the breeding season. They forage on the ground for seeds of bristle grass, pigweed, wood sorrel, spurge, panic grass, St. John’s wort, sedge, dock, pine, rose, wheat, or fig. They may fly up to grab a plant stem and drag it to the ground, holding it in place with one foot while eating the seeds. During the breeding season they catch grasshoppers, weevils and other beetles, caterpillars, bugs, spiders, snails, wasps, and flies. In addition to ground foraging, in the breeding season they also forage in marshes and in trees, sometimes over 30 feet off the ground. The buntings may pull invertebrates from spiderwebs, or even dive straight through a web to steal a spider’s prey. Painted Buntings are short to medium distance migrant. Western populations migrate to staging areas in Arizona and northwestern Mexico, where they molt before continuing to Central America—an unusual phenomenon for a songbird. Eastern populations molt on the breeding grounds and migrate to southern Florida and some Caribbean islands. Painted Buntings migrate at night. What equipment are you currently using? I just traded in my Tamron 28-300 for the new Nikon 18-300. It is much lighter, has no lens creep, and takes great pics. I decided not to get the Tamron 16-300 because the Pop Photo bench test results were not as good as the results for the 28-300. I also have the Nikon 18-140 which I use for parties and family gatherings. My point and shoot is the Sony RX-100. I’m using the Nikon D5200 but I’m planning to trade it in for the new D5500 with built-in WiFi and touchscreen monitor. The price for the body only is $896, the same price as the 18-300.